The contemporary design of the "Rialto" compliments even the most traditional of tastes. 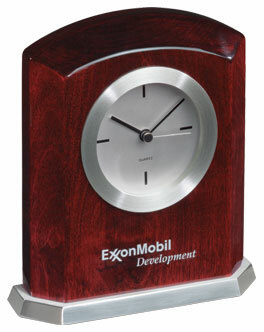 This aluminum clock is featured in a high gloss rosewood base with multiple customizations available. Imprint your company's logo to the hardwood surface or add a Selco custom die-struck medallion to give it that extra touch. -Imprint area 3.5" x 1.25"